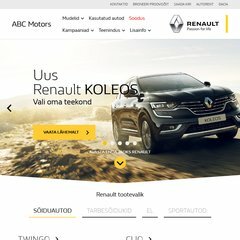 Topics: Abc Motors Renault Dacia, and Renault Facebookis. The estimated 42 daily visitors, each view 4.10 pages on average. The site is programmed for PHP/5.2.0-8+etch16. It is hosted by Modera Consulting O Tallinn, using Apache web server. Its 2 nameservers are ns.modera.ee, and ns.uninet.ee. PING www. (212.47.219.11) 56(84) bytes of data. A ping speed test response, is timed at 140 ms.